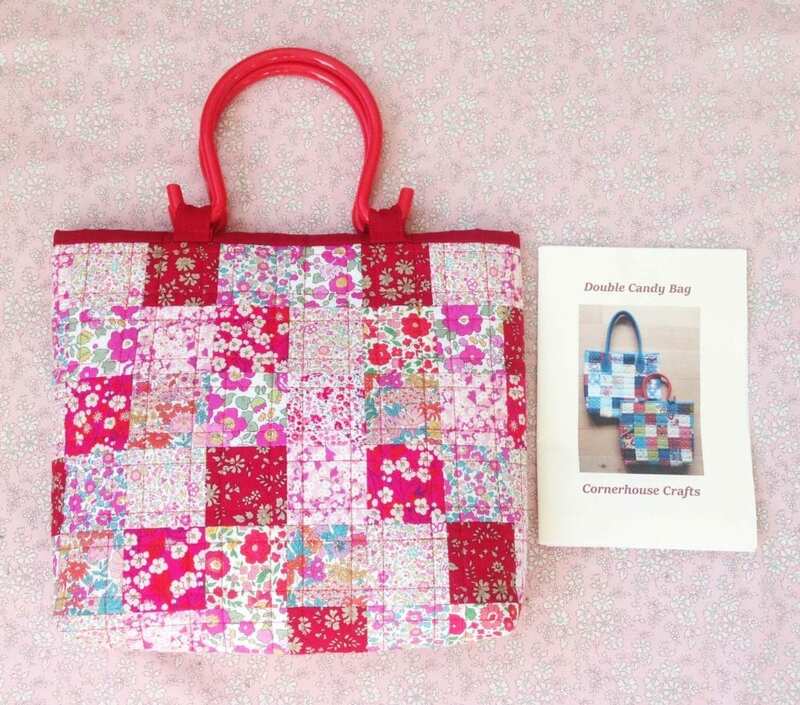 This Beautiful Liberty Patchwork Bag has been made by Dawn from the studio. Dawn is in a sewing group and is always arriving at the studio with another beautiful Liberty item. 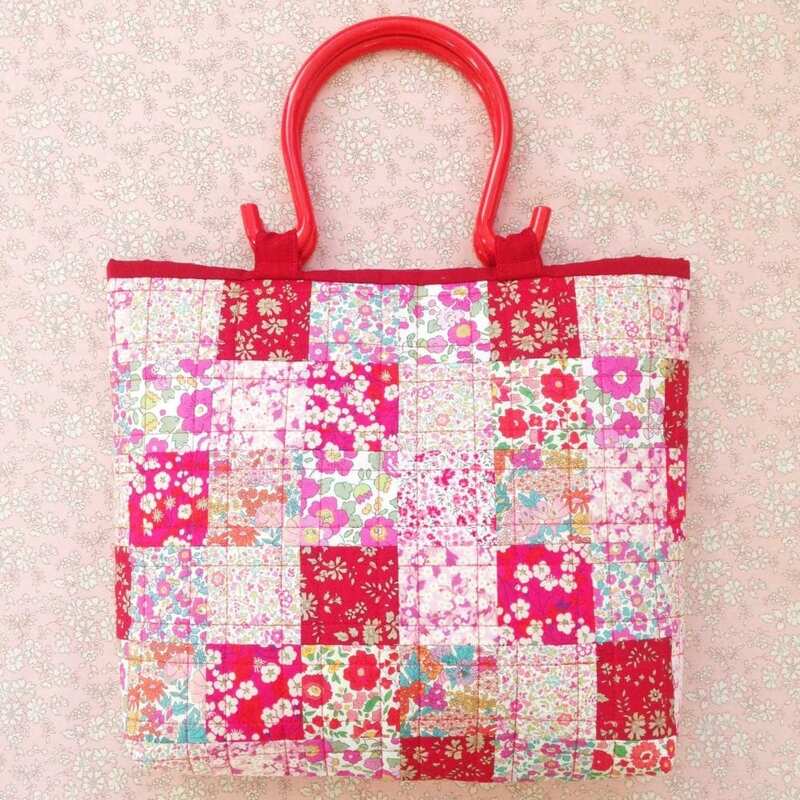 It’s got red Jelly handles by Lecien and is made using 2.5 inch Liberty squares. The deep red binding and red handles look great with the random Liberty squares. Many of us have a spare stash of Liberty lurking in our fabric cupboard. Mine is literally huge as I can’t bear to part with one off or vintage pieces. 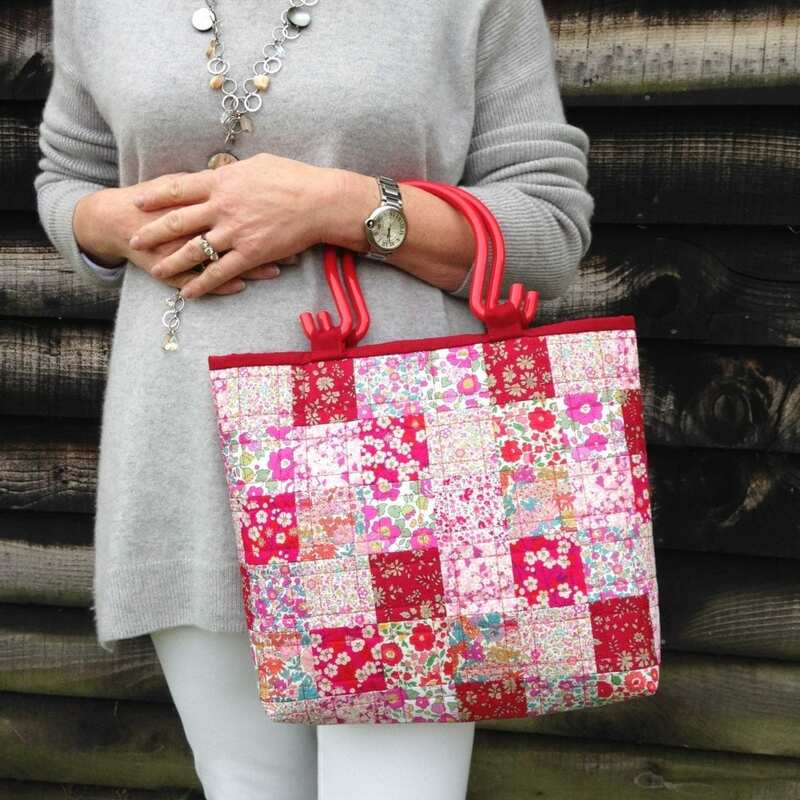 Dawn has put together pinks and reds to give this bag a really vibrant look. This is a great bag for keeping your latest sewing projects in. Use it to take a project along with you to a friends house for a crafting evening or anywhere you have a spare half hour to sew. Dawn’s sewing is always really neat. Her squares match perfectly together. This pattern uses a really great technique using a lightweight interfacing. 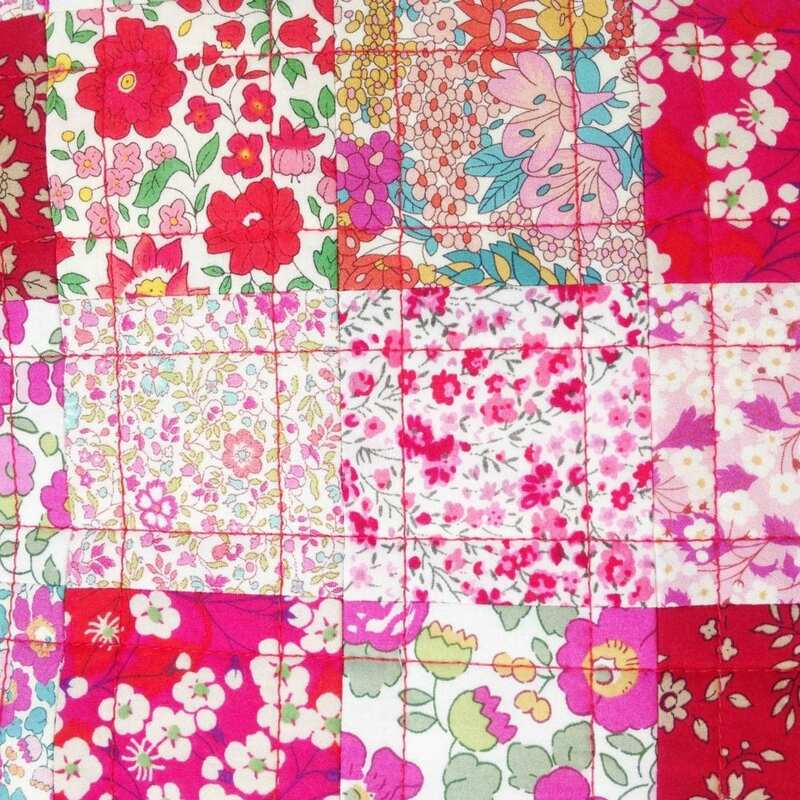 The squares are ironed onto the interfacing and then sewn together. It saves lots of time as there’s no need to pin and the finished intersections of the squares match perfectly. It’s a technique that was originally designed by Paula Doyle the author of Mini Mosaic Quilts. It’s really easy and makes the finished bag really accurate. 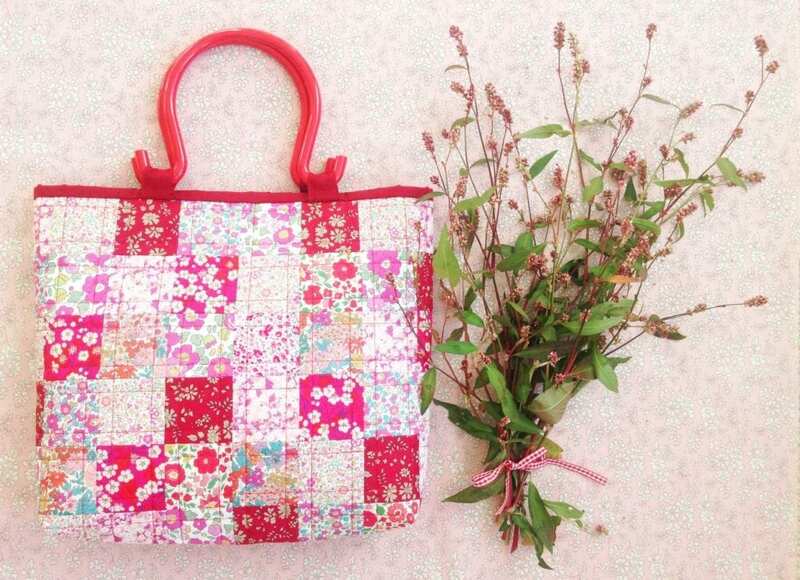 Dawn’s Beautiful Liberty Patchwork Bag. The pattern is designed by Sadie Yeomans from Cornerhouse Crafts. It’s called a Double Candy Bag. You can email Sadie to get hold of the pattern for £4.50 plus postage. I hope you like Dawn’s bag as much as I do. It’s always so inspiring to see what people bring into the studio on a Monday. The weekend is such a happy time of creativity. Happy Sewing.